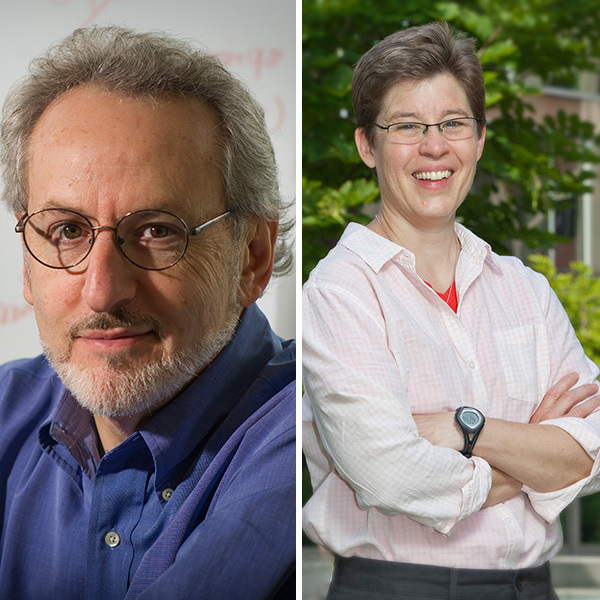 Two faculty members at the John A. Paulson School of Engineering and Applied Sciences (SEAS) – Jennifer Lewis, the Hansjorg Wyss Professor of Biologically Inspired Engineering; and Donald Ingber, Professor of Bioengineering – have been elected fellows of the National Academy of Inventors (NAI). Ingber, a cell biologist and bioengineer, is the founding director of the Wyss Institute for Biologically Inspired Engineering at Harvard University and also the Judah Folkman Professor of Vascular Biology at Harvard Medical School and Boston Children’s Hospital. He holds over 140 patents, founded four companies and has pioneered research in mechanobiology, tissue engineering and nanobiotechnology. Lewis, a materials scientist and 3D printing pioneer, is a core faculty member of the Wyss Institute. She holds more than 30 patents and founded the startup company Voxel8, Inc., to commercialize the first multi-material 3D printing for the fabrication of embedded electronics. Ingber and Lewis will be inducted on April 15, 2016, at the Fellows Induction Ceremony at the United States Patent and Trademark Office in Alexandria, Virginia. Previous inductees from SEAS include Richard McCullough, vice provost for research and David A. Edwards, the Gordon McKay Professor of the Practice of Idea Translation.